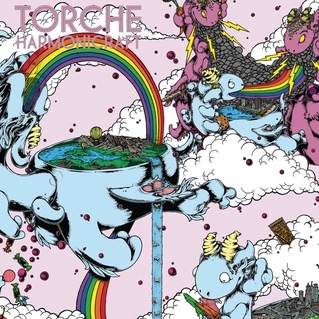 Yes, Torche are back with a new album coming on April 24th called Harmonicraft. ‘Kicking’, the first single, is streaming now on Pitchforck HERE with a free download to boot. This is the first record since 2010’s EP Songs for Singles and the long awaited album follow-up to 2008’s highly lauded Meanderthal. The unabashed poppy melodies are all in tow on ‘Kicking’ with the semblances the members’ sludge backgrounds still glimmering in the distance. Frankly, this tune is great. The album was self-produced, and mixed by Converge’s Kurt Ballou, who really gets around these days. Listen to the song NOW and check out the artwork below.